There are many options to implement a service-oriented architecture (SOA). A good SOA solution for one company might not be a good solution for another, even in the same business environment and IT landscape. Choosing a solid SOA solution involves strategy, vision, architectural thinking, and finally, technology. It also involves personal taste and organizational politics. So, why did we decide to write a book dedicated to SOA solutions on System z then? The answer is quite simple: the combination of the System z hardware, the operating systems that run on System z, and the SOA middleware provide specific functionality and influence the effectiveness of your SOA solution to a great extent. In other words, if you were to implement the same SOA solution on System z and on another platform, you would see different results. 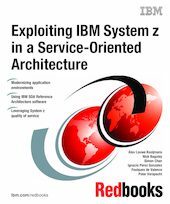 This book projects a large number of solutions in all areas of the IBM SOA Reference Architecture on IBM System z. Where appropriate we highlight the additional System z benefits of running a certain solution on System z. The primary audience for this book is IT Architects, especially solution architects, enterprise architects, infrastructure architects, and application architects.